Washington DC. Raleigh. San Jose. What do these 3 cities have in common? They are among the most underrated and underestimated tech hubs in country. 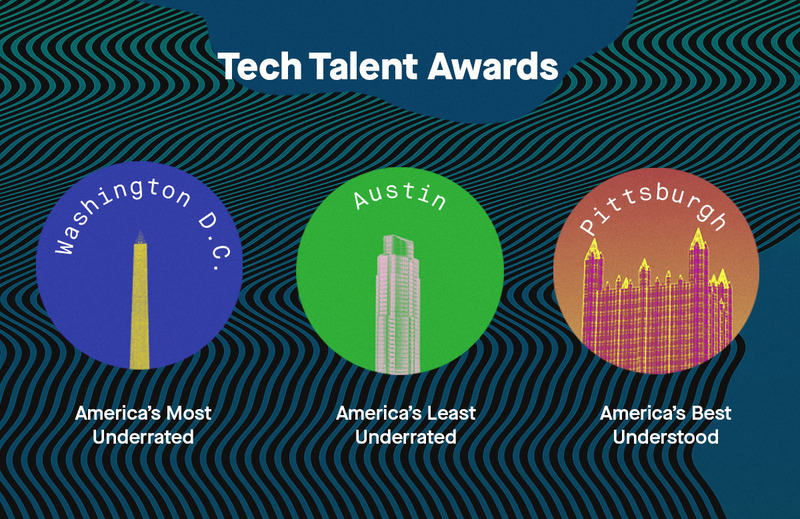 Thinkful’s rankings of the most underrated tech hubs show that there can be a significant disconnect between the quality of city’s tech talent and the perception of that city’s talent among job seekers. While the impact of this disconnect is hard to quantify, metros that scored low among job seekers should heed some concern about their ability to recruit top talent. 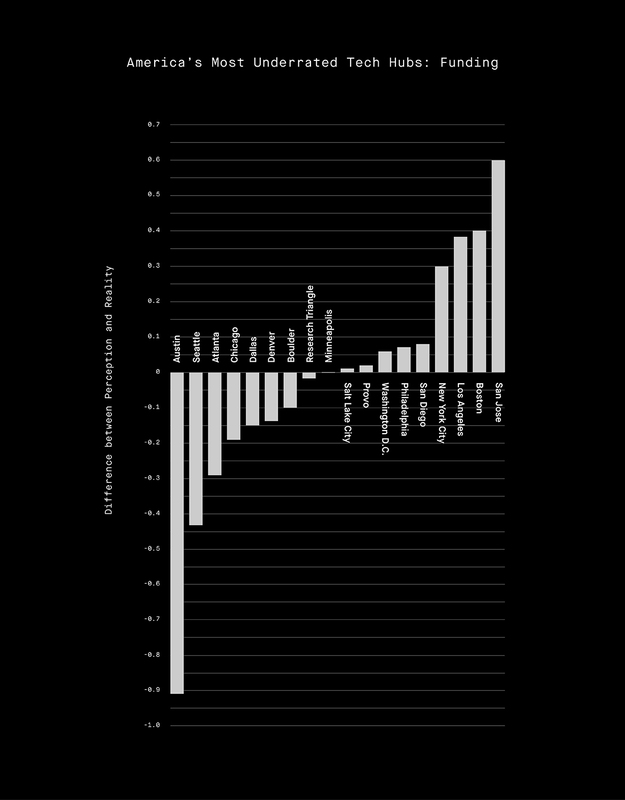 This chart below shows how 25 metros scored on quality of talent as measured by a CBRE study (Y axis) and the perception of that quality as measured by a Thinkful poll (X axis). Cities that appear in the top left quadrant are more underrated while cities in the bottom right are less underrated. 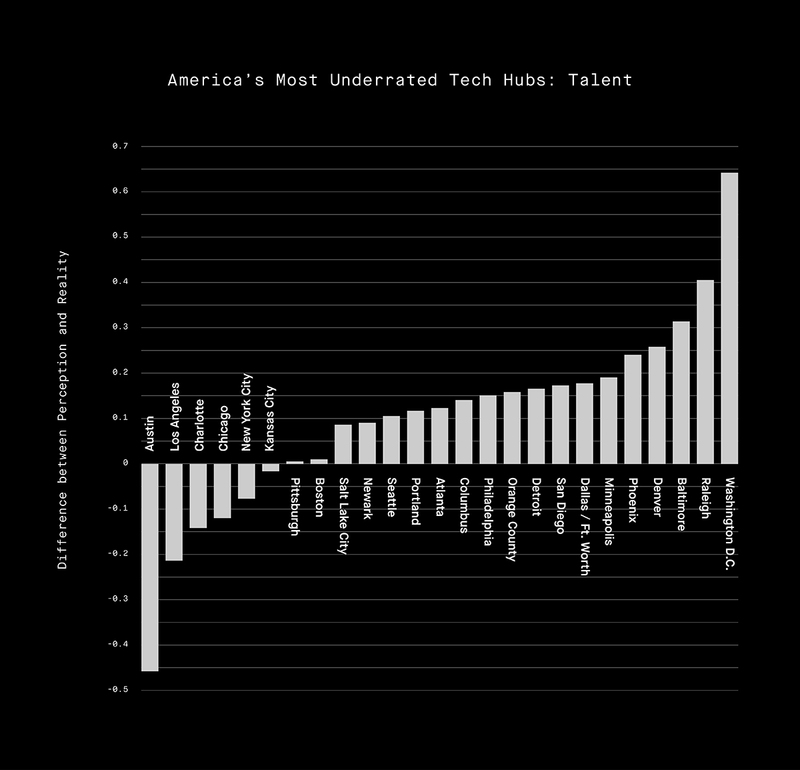 As measured by tech talent, Washington DC, Raleigh, and Baltimore are the three most underrated tech hubs. The rest of the rankings can be seen by reviewing the chart below right to left. Another indicator of a strong tech hub is the amount of capital invested in local technology companies. Our analysis shows that the perception of which cities have the most venture capital funding is incongruent with the actual concentration of venture capital. The chart below is a graphical representation of this disconnect. Data for venture capital funding (Y axis) was collected from a CityLab/Martin Prosperity Institute report. Data about the public’s perception of venture capital allocation (from X axis) comes from a Thinkful poll of job seekers. Cities that appear in the top left quadrant are more underrated while cities in the bottom right are less underrated. 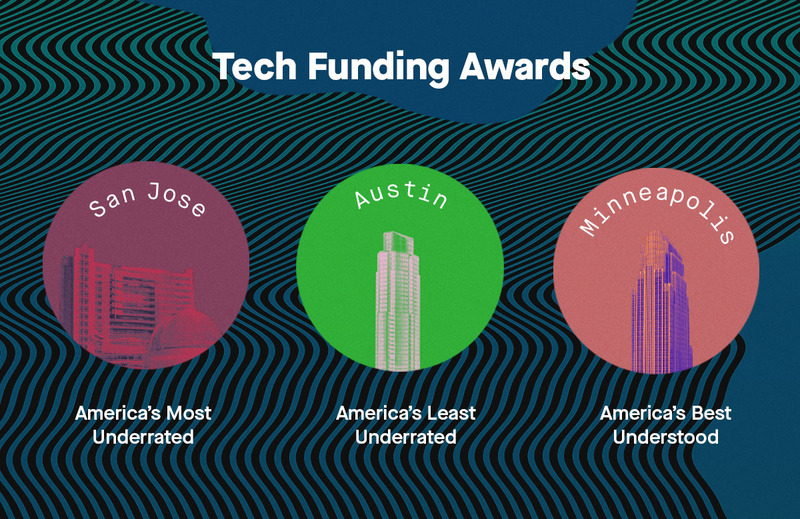 As measured by funding, San Jose, Boston, and Los Angeles are the three most underrated tech hubs. The rest of the rankings can be seen by reviewing the chart below right to left. Why do these rankings matter? 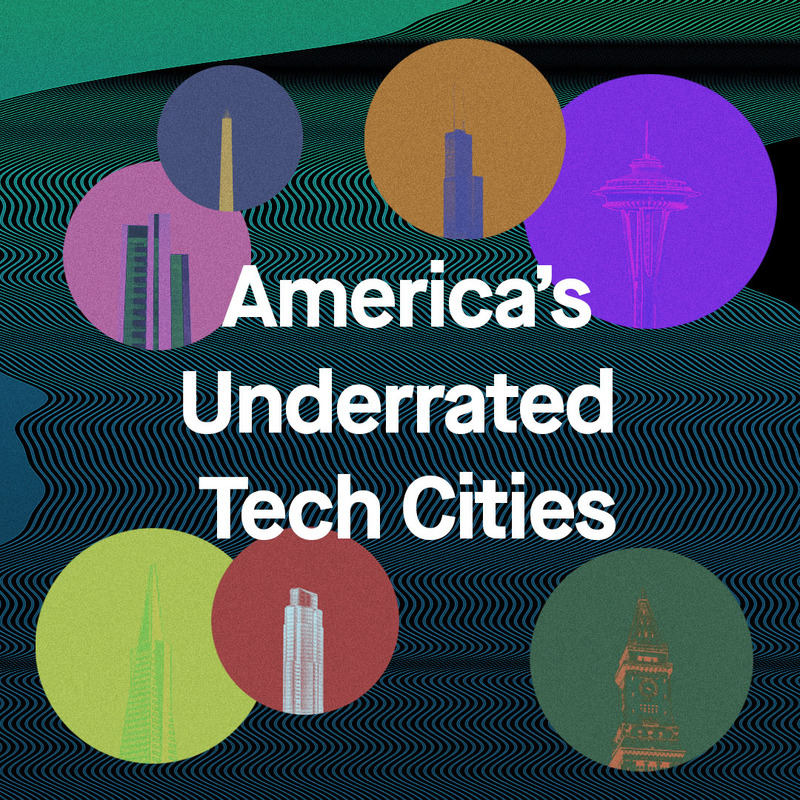 Which cities are America’s top tech hubs? Which cities does the public believe are America’s top tech hubs? How big is the gap between perception and reality? What makes a city a top tech hub? While there are potentially many ways to define a “top tech hub”, we decided to focus on two critical components: quality of talent and access to capital. 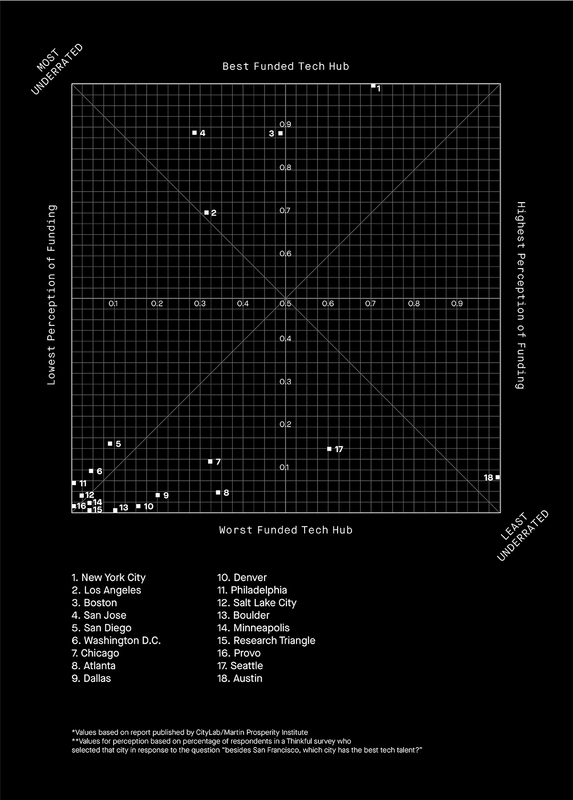 We compiled a list of America’s top tech hubs using information from the following reports. Scoring Tech Talent in North America 2018: This report by CBRE, a multinational commercial real estate firm, looks at 13 metrics to determine which cities have the top tech talent. City Lab/Martin Prosperity Institute Report: This report published by City Lab shows the geographic concentration of venture capital funding by Metropolitan Statistical Area. 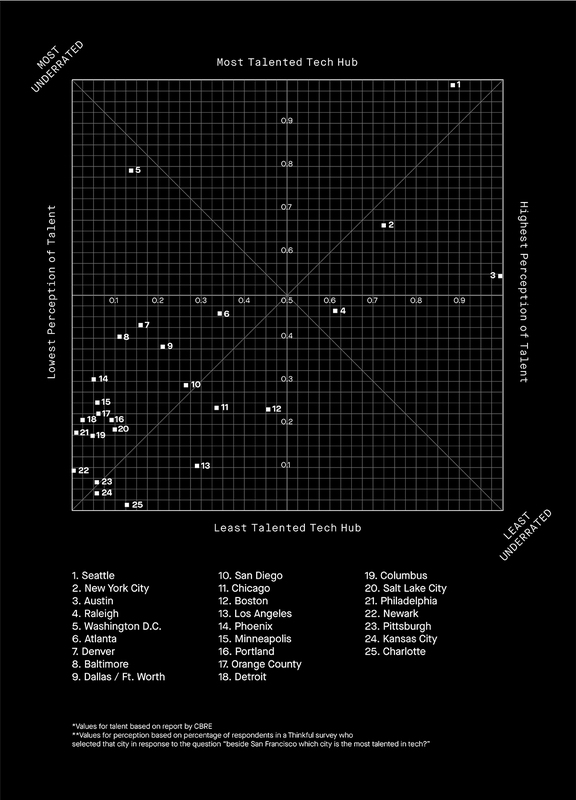 After San Francisco, which 3 cities have the best tech talent? After San Francisco, which 3 cities receive the most venture capital funding? In total, we received nearly 300 responses giving us an approximate margin of error of 6% for our population size. We then used a statistical process called data normalization to allow us to compare the “reality” data sets with our polling data. By finding the difference between the two, we were able to give each metro a score that measures how much of a gap exists between public perception and reality. The higher the score, the more underrated a city is.